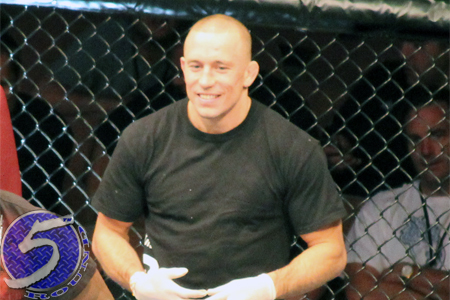 Fanboys will have flipped their calendar 19 times by the time welterweight king Georges St-Pierre (Pictured) returns from his extended hiatus to battle interim champ Carlos Condit at UFC 154. Out of sight, out of mind is often the mantra when it comes to athletes who are forced to ride the pine for long periods due to injury. So, GSP wanted to fill everyone in on exactly what he’s been up to since undergoing surgery on his right knee last December. On this week’s edition of FUEL TV’s “Ultimate Insider,” the baddest 170-pounder in bare feet shows that his sabbatical was the furthest thing from a vacation. Although, it did contain a heavy dose of R&R – as in, Relentless Rehab. St-Pierre looks to unify the welterweight crown on November 17th in front of his hometown peeps inside Montreal’s Bell Centre.